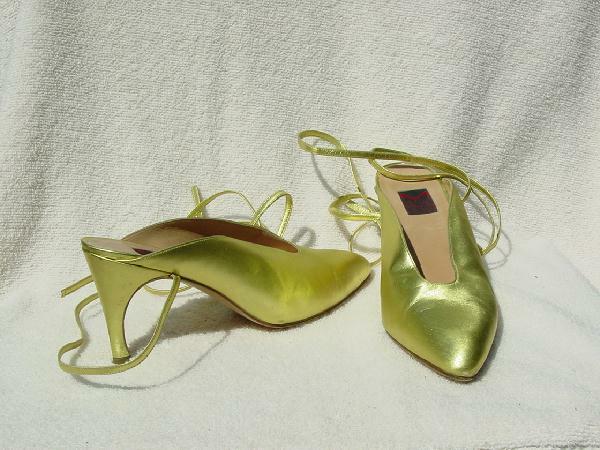 These gold lame pointed-toe shoes have open backs. They have 1/4" wide ankle straps that are 26" long. The heels are odd-shaped - straight in the back and curved in the front. There are scuffs and scrapes, but since they are party shoes, that's to be expected and it doesn't detract from these unique shoes. These unbelievably soft all leather shoes were made in Italy. They're from a stylist's collection.